Padubidri, Feb 02, 2019: Udupi Deputy Commissioner Priyanka Mary Francis took the officials of Navayug Company to task for failing to solve the row over the four-lanning of NH 66 at Padubidri. She directed the officials to complete the pending works within 15 days. Following the digging of service road, the problem of dust has aggravated in Padubidri. 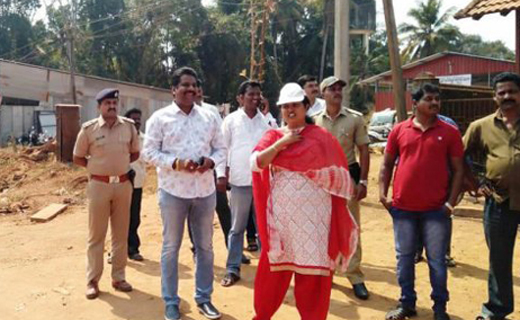 Priyanka directed the contractor Navayug Construction company to spray water on the service road thrice ( in a day) to check the problem of dust. The residents brought the issue of incomplete service road in Padubidri which is severely affecting the road users to the notice of deputy commissioner. The parking of the vehicles on service road has further added to the problem, they said. The signal light and streetlights should be installed on Karkala Junction, residents said. The Gram Panchayat members said that the lack of space has affected the construction of bus shelter at Padubidri. The construction of bus shelter in front of Gram Panchayat building will inconvenience the people. Priyanka directed the gram panchayat authorities to identify the land and submit a proposal to the Navayug Construction for the construction of bus shelter.